Optical Character Reading (OCR) software is tricky. Although it’s come a long way from the unreliable and inaccurate offerings of the 1980s (when it first became available for personal computers) if it doesn’t present you with a usable digital representation of your (scanned) hard copy which is also 99% accurate, it really has little more than curiosity value. California-based specialists, Musitek, have set a higher challenge. 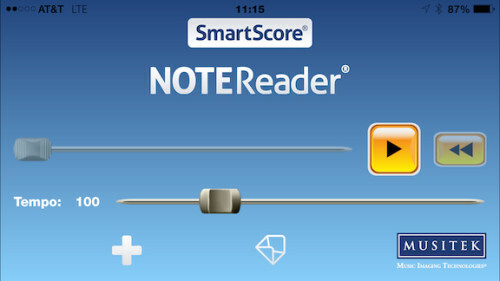 Their SmartScore NoteReader software for iOS (also available on Android) turns the image(s) captured by the iPhone’s camera into playable musical notes. You’d be forgiven – even these days – for having too much faith in a system that claimed to allow you to use a mobile device to capture a sheet of notes on the stave and – within seconds – hear on your iPhone what you just captured there; and (with the in-app purchased Première version, $9.99) export the digitized version to use elsewhere. But NoteReader does just that. It works well, extremely well. With that relatively inexpensive Première version you can export, send, share digitized files, and otherwise reproduce them for manipulable playback on your desktop using either Musitek’s SmartScore free Player (the more fully-featured X2 series when not discounted costs $399); or most of the mainstream notation software: Sibelius, Finale and Garageband. 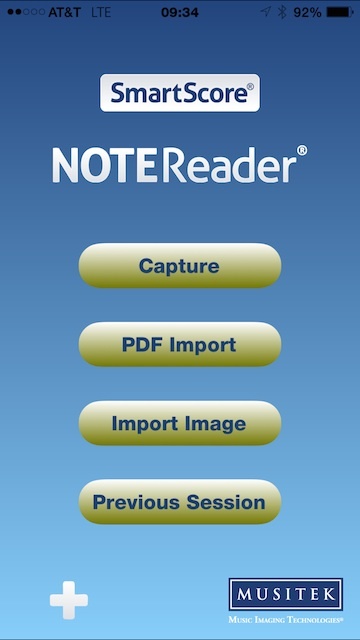 NoteReader is easy to use. Very intuitive. To capture a page (with the iPhone’s inbuilt camera – and 5 or 6 is recommended – at least an 8 Megapixel camera), tap Capture, frame the page of the score properly, tap a camera icon; when Done, the screen with the digitized segment is displayed for you to play back though earphones or speaker. The fact that the online “manual” page contains so few paragraphs is a good indication not only of the simplicity of the application; but also of how well it has been designed. There are also a couple of explanatory videos here. None of this is any good, though, if the resulting digital version is inaccurate, has gaps, errors or is otherwise unusable. In fact it’s excellent – especially if you follow Musitek’s advice to try for indirect daylight inside and near a window. Or direct morning or evening sunlight outside. In the middle of the day, a shaded area with good ambient light works best. If your score is bound or otherwise has a tendency to move, curl or bend, you might benefit from one of the non-reflective acrylic sheets which Musitek also sells. In testing, though, the expected limitations and need for lots of experimentation to find ideal lighting never materialized. Everything just worked. Approached with the same skepticism that many potential users will have – until they’ve tried this software – it was full of pleasant surprises from the beginning to the end of the review period. The software also has a ‘Session manager’ which allows you to review and delete the files you’ve digitized on your device. You can also import a PDF or image into the iPhone app in the first case by selecting such an email attachment and in the second by selecting an image in your Photos Album. the built-in sound player necessarily reproduces a single stave of notes – such as the Treble or Bass clef of a piano; you’ll have no success with a string quartet or even non chordal multi-timbral writing. If these limitations are not barriers and you have a real need to be able to digitize photographed scores, or previously captured images or PDFs in such a way that you can hear them with simply-synthesized palpably electronic-sounding output on your iPhone, then take a close look at SmartScore NoteReader. For many users, though, that will be just the start. Assuming you can work with a single page of notated music (see above), you can set about working with the scanned music file. You email it to yourself as attachments in three formats: .ENF (SmartScore’s own format), XML and MIDI. Then open it in – respectively – the free or paid (much less basic) SmartScore Player; a conventional notation program like Sibelius; or MIDI playback sequencer etc, including QuickTime. These worked very well – every time – during evaluation. Musitek does not support NoteReader by email or phone. Questions have to be posted to their forum, which seems fairly lively and relatively frequently updated. Try the FAQ first; there really isn’t a lot to go wrong. 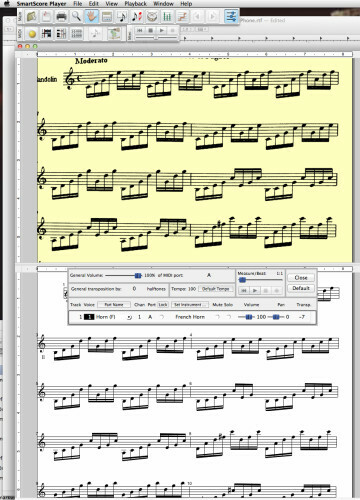 What NoteReader does it does very well indeed. It combines simplicity of use (a workflow that’s so quick and intuitive that multiple pages/photos could be captured if you need to – on your iPhone; simply tap on the camera icon (bottom right) after each capture to stack up multiple pages in a file before tapping ‘Done’ – though the resulting file could be too large to email and you’ll have to use DropBox or Google Drive) with an extremely reliable and error-free rendering engine. If this is what you need to do, you won’t be disappointed with NoteReader. This article is a total fraud. I don’t think that Mr. Sealey really did any objective evaluation for this product. I paid $79 for SmartScore X2 Piano Edition. It creates .ENF files to save the sheets. I just purchased the unlocked version of SmartScore Note Reader version of iOS. I do not see any difference between the free version and the paid version, except that the unlock icon is gone. Mr. Sealey, if your article was objective, you would have tried to open a MIDI or .ENF file in the paid version. You are right about stating that manual says very little, but that does not mean the software works. I did indeed evaluate all aspects of SmartScore NoteReader extensively for the review, as described! I was pleasantly surprised by the results it gave when the lighting and resolution are adequate – OCR can be tricky, of course; I stand by my evaluation and conclusions. I am sorry – if I understand you aright – that you were not satisfied. May I suggest contacting Musitek if you are having difficulty getting your particular combination of software to work?